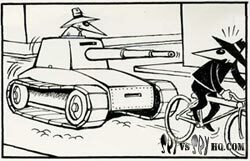 Prohías is the creator of the Spy vs. Spy comic strip and did all the work for the strip from its inception in the January 1961 issue to its completion in 1987. Rapidly declining health in later years forced artists Bob Clarke and Don Edwing to help with the finalization of the comic strips for production. After his last issue, Prohías left sketches and unfinished works that were later finished or “ghosted” by Bob Clarke and Don Edwing. 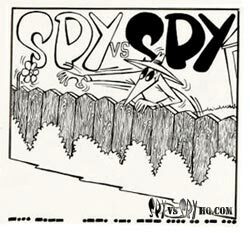 Don Edwing was first asked to take a stab at writing a Spy vs. Spy comic in 1986 by the editors of MAD. 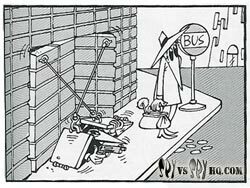 His first Spy vs. Spy comic strip appeared in the MAD January 1987. He paired up with Bob Clarke who took Don’s ideas and concepts and drew into production. The two of them and done countless Spy vs. Spy works and have illustrated two Spy vs. Spy paperback books, The Updated Files #7, and The Updated Files #8. Dave also was a contributor to the Spy vs. Spy comic at MAD. In 1995 David was given preliminary unpublished sketches by Prohías to finish. They were published in the July 1995 magazine. In April of 1997, Peter Kuper a native of Cleveland Ohio took over the Spy vs. Spy comic strip with his unique stencil and spray paint style. He transformed the 36 year old idea with a new taste of violence and action creating a whole new generation of readers. 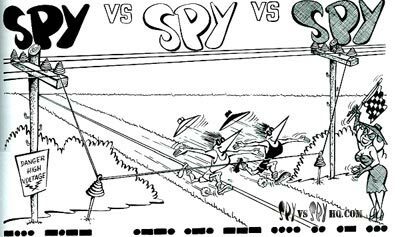 In case you’re new to Spy vs. Spy, the typical plot would consist of one spy setting up some sort of trap for other to be lured into and killed. Some of the traps are so complex and absurd that they work flawlessly, or the other spy would come up with a brilliant counter plan of his own and be the hinder his efforts. In many cases the spies use crazy contraptions to counter the other spy's trap. It is quite difficult to decide which spy is the victor throughout the story. At certain parts of the stories you were certain that one spy would be victorious, and then the other spy comes back with some counter measure totally catching the other spy off guard.